Based in the Richmond, Virginia area, K-9 Alert Search and Rescue Dogs, Inc was originally organized in March, 1989. The group was formed to help fill a geographic gap in Search and Rescue (SAR) dog resources in central Virginia. 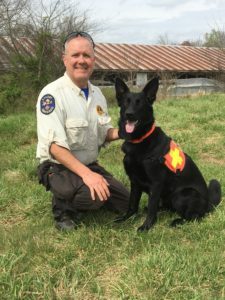 K-9 Alert is a member of the Virginia Search and Rescue Council and operates as a state resource under a Memorandum of Understanding (MOU) with the Virginia Department of Emergency Management. Team members specialize in various SAR categories to include Air-Scent Dogs, Water Recovery Dogs and Land Cadaver or Human Remains Detection (HRD) Dogs. Click Here for Complete Canine SAR Types. Besides the area of specialization, this training encompasses but is not limited to wilderness survival, emergency first aid for both humans and K9’s, crime scene preservation, court room procedures, confined space safety awareness and procedures, swift water safety procedures, as well as MLSO/PSO and FTM/FTL as appropriate for the team. All operational team members are certified in NIMS procedures in the categories of 100a, 200a, 700a and 809. K-9 Alert requires all operational dog handlers to become Amateur Radio Operators, further aiding in communications in transit both to and from searches and during the actual search. Members in-training assist dog handlers during searches with communication, navigation & record keeping. K-9 Alert can be contacted in an emergency through the Virginia Department of Emergency Management.